I tried to emulate a oscillator inside of VCV Rack. The osc is called „FM-OP“ from „Bogaudio“. You can think of it like a single operator/operator of a DX style FM synth(inclusive envelope generators, FM Feedback etc.). If anyone knows a similar Osc in hardware form, please let me know. Hi Kari, which 4op synth exactly are you looking to emulate/improve on? Your right, but i already have some of those modules, 1xQZVCO, Frames, Stages (1x), Shades(2x) and kinks. The Akemies Castle is pretty cool, and it would be faster to work with, but i like to be able to patch any possible algorithm. I probably won’t buy the Mordax Data, because i will get a Expert sleepers ES-8, so i will be able to use multiple oscilloscopes via VCV Rack. One thing to be clear about is this: there is no way to build a Eurorack that’s cheap AND capable. Often you hear that a semi modular is a good entry point, as it will come with the essentials included. Not a bad start, but it may come down to how you want to integrate your Eurorack. If you plan on using the DFAM as a sequencer, that’s one thing. If you want to use the Digitakt, then you’ll need a MIDI to CV module. Audio is at a much higher level, so you probably would want to consider an audio output module (unless the DFAM can accept 10V audio). 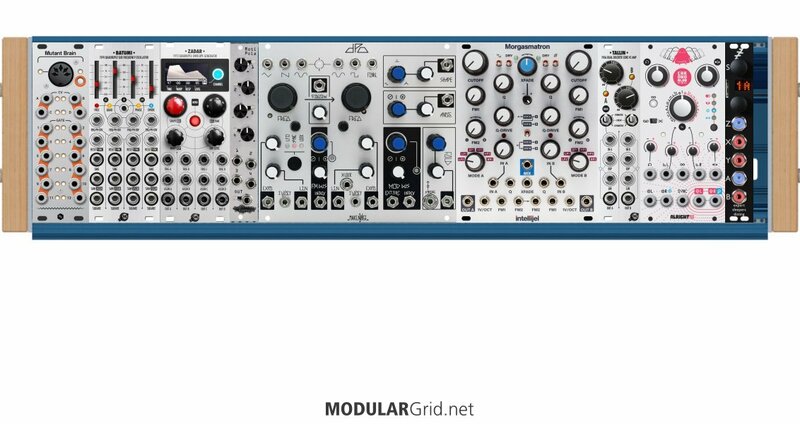 Module math: a cheap module is more expensive in the end. Case in point is your STO, which runs you $199. It’s a single OSC. Now compare it to the DPO, where for $599 you not only get two OSC, but also internal sync and FM, but a waveshaper/folder to boot, so you’ll have to compare that cost to a dual STO + uFold or Fold Processor, where you’re now at the same cost, but still not quite the same function. It’s even more obvious if you look at a quad LFO vs “cheap” 2hp LFO solutions. But it always comes down to subtle differences in function (STO has a sub, DPO doesn’t). For analog VCOs, I would recommend to look for dual VCOs or those single VCOs that can easily be synced. Beyond that, you might find wavetable digital OSCs interesting. Plaits is nice, so are many of the Noise Engineering modules, such as the Ataraxic Iteritas or Loquelic Iteritas. Maths was among the first two modules I ever bought. As a straight up envelope generator or LFO, it doesn’t really convince. I’ve honestly put it aside for now, as it requires time to dedicate to it to make proper use of it. At the outset, I would suggest to go with simpler, but high function density modules. I’m a big fan of the XAOC Batumi + Zadar combo, which gives you Four LFOs and Envelopes (the latter loopable on timescales up to almost a hour). In a small system that gives you a lot of modulation power. Thread: Ridiculously high prices in marketplace? You can choose not to buy. It is true! Retailers are getting more impudent now. What can we do? It's interesting, but it also seems a bit much like overkill and unnecessary expense. Wouldn't it be simpler to use an ALM Akemie's Castle as the core of this, instead of the discrete quadrature VCOs, etc? Actually, Thomann UK is giving me a UK price for the Quad VCA of UKP 170.43, with VAT included. The same thing in EUR is 199. And when you switch those to $, you get 224.19 and 225.05 respectively. But if I use Thomann USA, then the same module is $188. So what gives? Simple: there are going to be taxes and tariffs that vary from place to place. Intellijel, for example, is a Canadian firm. So let's look at Moog Audio (based in Montreal) where we find that module at CDN$ 250, which comes out to be $186.75. So...that's different, too. Therefore, it should be considerably more in the USA, right? Well...no, as Perfect Circuit has 'em at $189. Sooooo...it's not merely the taxes and tariffs. In some cases, it comes down to an agreed-upon price for a module between manufacturers and retailers, too. Perfect Circuit is nowhere as huge as Sweetwater...but there, too, we find the Quad VCA in question at the same $189. And when you look further, you'll tend to see the same "street" prices from continent to continent. Looking at one place in Asia that has serious tariffs, we find that Clock Face (Tokyo) has that very same module for JPY 22,900, which comes out to $207.02. This gets screwy all over the place. If you think you're getting overcharged for new Intellijel stuff, have a look at what new Doepfer gear costs at Schneidersladen...and then check the same things at Perfect Circuit or Analogue Haven. This problem is just an endemic effect of having manufacturers all over the planet. A bit late, but had a good transaction last year with @NU. The idea is a four Operator FM Synth on a modular basis. You can patch any possible algorithm and its even possible to morph between carriers by using the MI "frames" modul. FM Feedback can be patched with the MI "Shades" modul, which also allows may other usfull things. The MI "Stages" are in daisy chain and can be used for complex envelops, LFOs, or performance slider( combined with "shades" it allows control of CV's for further FM modifcations. 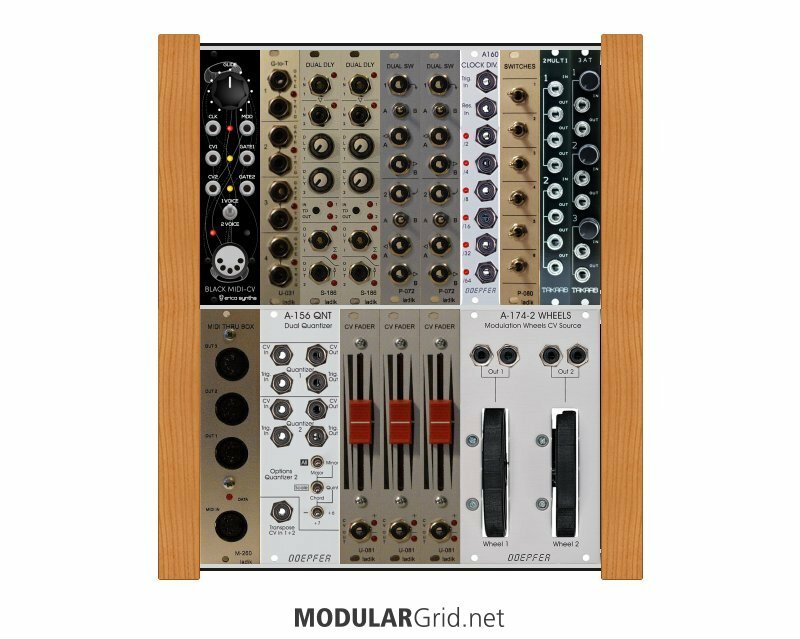 All the "important" modules (like Sequencers, FXs, EQ, VCOs, Filter, Joystick, Resonator....) are in my other racks. I probalbly gonna buy a dedicated case just for this FM synth. Any idea if this would work? Did i forgot anything? Would love to get some feedback! Thanks! Perfect deal with @Virgil, selling his own gorgeous µo_c build. Thanks! There is no standard path for your journey into Eurorack... only an entry point. Buy a case that's much larger than you think you'll need. Shelling out cash for a case isn't a lot of fun. It doesn't make any noise. But having a case that will grow with you will save you a lot of grief in the long term. There are some really nice, albeit larger modules that you might want along the way. Finding space for them can be challenging in a smaller case. 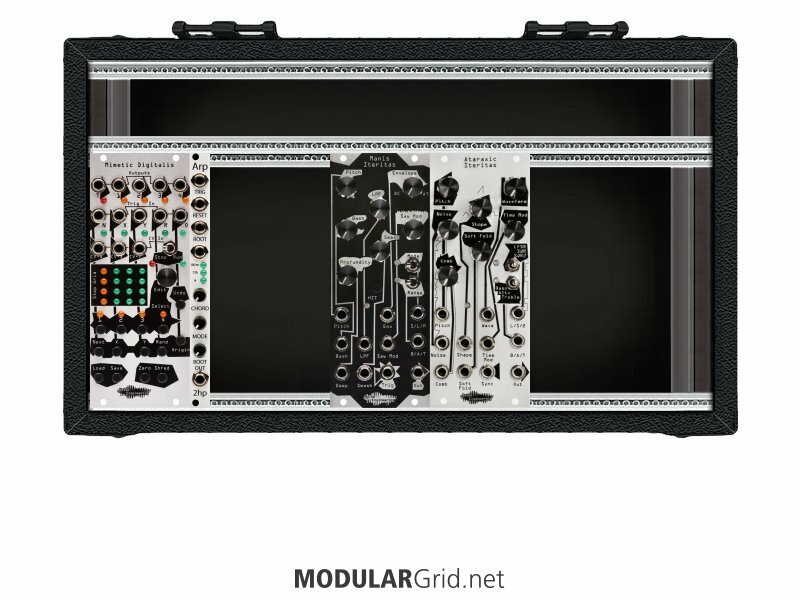 Your larger case should hold on to most of its value if you decide Eurorack isn't for you. My personal strategy: I put together a system with two oscillators, a two channel multimode filter, four VCAs, a quad LFO, and some mixers/attenuverters. I also added a delay, reverb, and a line to synth level input/output. A MIDI to CV converter and I was ready to hook up to my DAW for some fun. From there, I added a few multifunctional modules like a Disting Mk4, Ornaments & Crime, Temps Utile, etc. The multifunction modules allowed me experiment a lot with my system. If I used a function over and over then I'd consider getting a dedicated module for that purpose. Don't forget about CV controllable FX. Dry sounds aren't very inspiring for the most part. A simple "bloop" with some delay and reverb can go very far verses a complex sound that's bone dry. Okay... I've kind of meandered... but I'm still on my journey. I've already expanded into my second 208HP case and it's almost full. Go slow with adding more modules and try stuff. 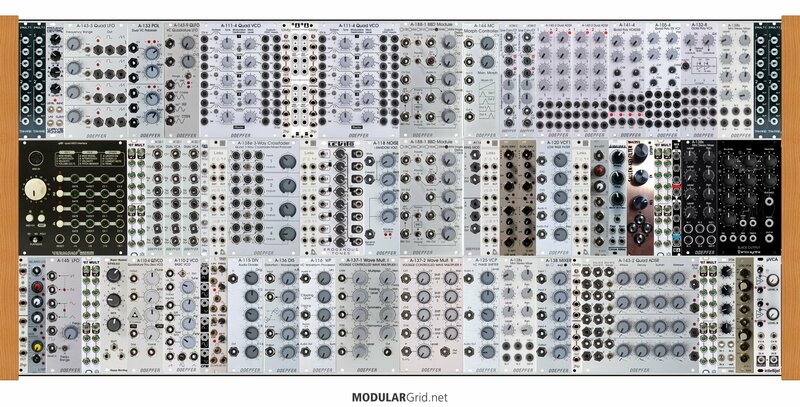 Watching Youtubers use the modules you've bought is great inspiration for creative patches you may not have thought of. Eurorack modules aren't made in great numbers for the most part. There are a couple of really successful modules out there that are the exception. The prices stay high because of limited availability. "Out of Stock" is pretty normal on most dealers' websites. I typically avoid used modules because you just don't know who's been messing with them and if all of the features work on the day you receive it and try to test it. Saving 20% isn't enough of an incentive to risk my 80% on a dud module and all the hassles that come along with it. Dealers will simply exchange a defective new module. A one-time sale from a third party is a crap-shoot. The standard convention is that the red stripe goes with the -12V pin. Most manufacturers hold this convention. But please note, there are a couple of a-hole outliers that insist on reversing the polarity because... reasons. So on their modules the red stripe goes with +12V. I won't name names but they are huge a-holes. The first thing to do is to pop open the manual (hard copy or online). The manufacturer will usually explain the pin configurations for power. Now look at the manual for your power supply. Confirm that it matches or you make the correct configuration. Once you have your modules plugged in (without plugging in the power supply to electricity), stop. Go have a coffee or a cup of tea and come back and confirm your work. Don't screw the modules into your case until you've gone back and confirmed the power ribbons are all the correct way around for the module. It's very easy to plug in your modules. It's even easier to mess up, plug one (or more) in backwards and simply fry hundreds or thousands of dollars worth of kit. Think of plugging in modules to a power supply like handling a firearm. You slow down and confirm every single step and that you're doing things safely. It's not a difficult thing. But it's the third or fourth time you rearrange your modules that you get careless and fry something. Here's a video on modules, power supplies, and a-hole manufacturers. The thing about a Marketplace is that sellers can set the price they want and buyers can either choose to buy or not. If the prices stay high, it means there is sufficient demand for goods at that price. Hi all. New to modular. Just took a glance at your marketplace in here. Fx. Intellijel Quad VCA for 150£. That’s more than new price from Thomann? It seems to be the case for more than 80% of the listings - they are all very close to the new price (5-10% cheaper, tops) Whats going on with that? Bought a DFAM last week in here. Ended up costing me 450€ - new it can often be found for 520€. Seller tells me this was an unheard of price, and I was very lucky he was in a good mood.